The Queen Victoria Diamond Jubilee Fountain was unveiled on the 5th January 1900 by Lady Sweet-Escott, the wife of the administrator, Ernest Bickham Sweet-Escott as a celebration of Queen Victoria’s reign. The Fountain is pure artistic value and is made of porcelain, decorated with intricate and elaborate patterns with a small water tap and basins on the three sides. Crowning the Fountain is 30cm statuette of Queen Victoria, of which is also believed to be the smallest representation of the Queens likeness in the world. Not many people know that you can quench your thirst at this artistically quaint water fountain. Not only that but it’s a beautiful work of art to admire. 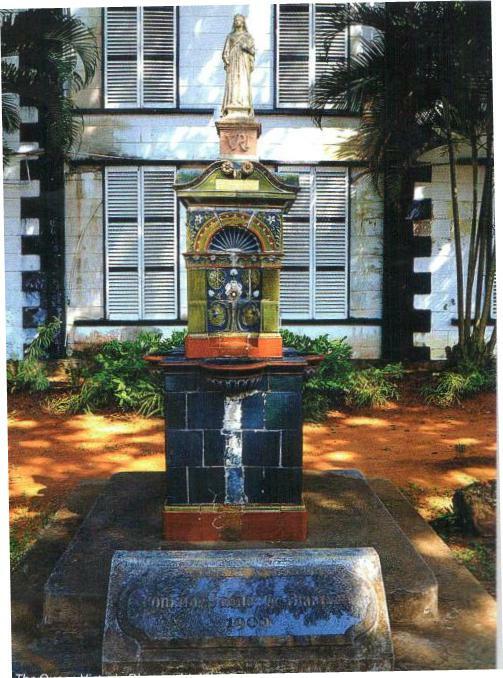 The drinking fountain is a Historical symbol of the Seychelles’ appreciation of her majesty, and today epitomizes that our islands were once a part of the British monarchy. 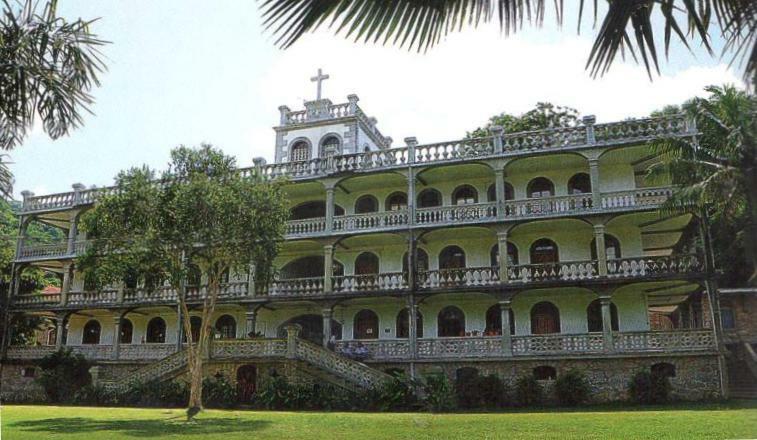 A magnificent and majestic building, the Domicilium is the residence of the Catholic Priests, and a symbol of the early years that young Christian missionaries ventured on the shores of our regal islands to spread the gospel. Brother Gélase was a capuchin missionary from the province of Fribourg in western Switzerland, and arrived in Seychelles in November 1928, at a time when most parishes on the Island had a resident priest but no communal building to house them. Brother Gelase noticed this and made it his mission to build a grand home for the missionaries. Thanks to him and the men who worked hard to build it, The Domicilium was built between 1930 and was completed around the end of 1934. 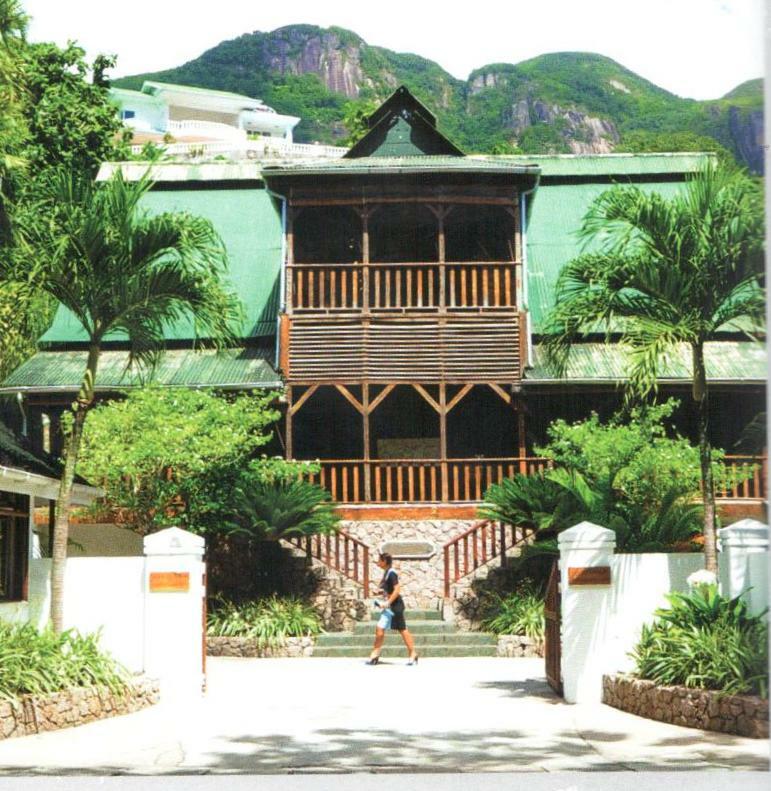 As a result of the sheer hard work and its completion it became the first communal residence for the missionaries and the resident priest in Seychelles, and to this day remains so. Truly Unique and divine, the building is surmounted with an exceptional cross and represents the greatness of the Catholic Mission in Seychelles that has contributed to the strong Catholic Tradition on the Island. A beautiful little church with a heroic story to tell. It might seem odd that the church was built between 2000 and 2004, but this is where the story gets interesting; it was built in the original place of the Church that was built there before. The site on which the new Church now sits has great historical meaning. In June 1830, at a time when Catholic Missionaries seemed to have not yet arrived in Seychelles, Reverend William Morton of whom was an Anglican Missionary and Scholar from India came to visit the Seychelles, and reflected on the possibility of building an Anglican church. With the thought still in mind, the reverend left Seychelles after baptizing around a hundred inhabitants and at the same time quickly informed the Church of England that the Seychelles was in great need of a permanent chaplain. And so, the post was offered to him and he returned to Seychelles in October 1832, still intent on building the church he had wanted to years before. But this dream of his never came true, due to the lack of support fro the colonial authorities a year later he left Seychelles and returned to India. Thanks to a permanent civil chaplain, Reverend George Ferndinand Delafontaine, a decade later aft Reverend William Morton left, the Anglican Church spread and grew in the Seychelles. As a result of h ministry’s influence and with the arrival of another civil chaplain in 1855, Auguste Fallet, plans to build the church began to finally materialize. 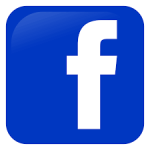 Consequently, on the 15th May 1859 the small church of St Paul’s was consecrated by the First Anglican Bishop of Mauritius, William Vincent Ryan. Not only did this church serve as a place of worship for the growing Anglican population, but it also ber.ame right for those in the face of danger. In October 1862 a great avalanche devastated Victoria and many inhabitants seeked refuge in the church and sacks, of rice that were able to be salvaged from the debris were stored in the bell tower. At this point in time the church became a significant sanctuary for the homeless families whose homes were destroyed in the disaster. 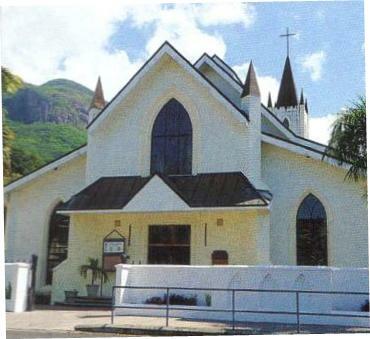 As the decades passed the small church was extended and renovated to accommodate the growing Anglican population in Seychelles, many of whom were liberated slaves. Interestingly enough, King Prempeh of Ashanti who had arrived in Seychelles to seek exile was baptized in the church on the 29th May 1904. In April 1961 the church was given the status of Cathedral by Bishop Alan Francis Rogers in Mauritius, of whom also ordained the first Anglican Priest of Seychelles, Father French Chang-Him in 1963. As time went by the church began to deteriorate and it was decided that the building would be demolished and rebuilt. And so, on the 15th April 2004, Archbishop Chang-Him inaugurated and re-consecrated the new Church that still stands today. The new church is one of grace and beauty, yet it also symbolizes the history and importance of the church that was there before and the remarkable significance it was to the population at that time. A grand white geometrical sculpture, with three pairs of extending wings that are exquisitely curved upwards, this symbolic monument has important patriotic value. The monument was inaugurated on the 4th June 1979 to commemorate the 200th anniversary of the town of Victoria since it was founded in 1778 by Charles Routier de Romainville. The monument was designed and created by an Italian Artist named Lorenzo Appiani and with the help of the workers of Laxmanbhai Construction, it was completed and stilt stands today. Locals call it the Moniman Twa Lezel (three-Wing monument) for jts unusual resemblance to the Seychelles’ tropical white tailed bird the Payanke. 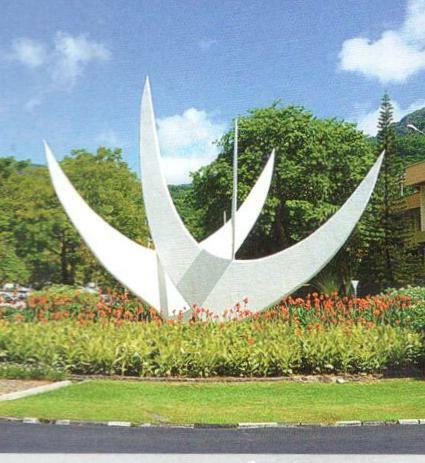 Although that could be true, the monument symbolizes the triadic origins of the Seychellois people, namely the three continents – Africa, Asia Europe. The sculpture is unique owl reminds the Seychellois of their mixed Heritage and the harmonious blend of their deep ancestry. Pierre Poivre was a French naturalist and administrator of La Reuinion & Mauritius who was said to have had a strong willed character and is no doubt an important figure in the history of Seychelles. Astriving adventure, in 1771 he commenced expeditions to smuggle spice plants from the Dutch East Indies, of which included Cinnamon seedlings. Cinnamon being the important component in Poivres link to Seychelles. He brought seedlings he smuggled back to Mauritius to add to the Jardin des Pamptemousses, which he had already created with Philibert Commerson. Upon hearing that Mahe had a suitable climate and fertile soil, Poivre was absorbed and committed to growing a spice garden in Seychelles. He dispatched his trusted representative, Antoine Gillot to travel to Seychelles under his orders and commence the task of cultivating a spice garden that later became Le Jardin Du Rois. Cloves, Nutmegs and most importantly Cinnamon grew in that garden until it was destroyed in May 1780. Luckily enough, nature has her beautiful ways and wildlife had already propagated the cinnamon seeds over the hills of Mahe and as a result Cinnamon trees grow in pure abundance in the mountains today. This abundance was the main contributor to the Seychelles exporting its first cargo of 740,123kg of Cinnamon in 1908 and along with the 67 Cinnamon oil Distilleries on the island. As cinnamon became more and more Important, the crown lands of Mahe and Praslin were leased for cinnamon cultivation. It can be said that it is thanks to Pierre Poivres rigour and ambition that Cinnamon became such an important economic source, a part of the plant family and culinary attribute in the Seychelles culture today. 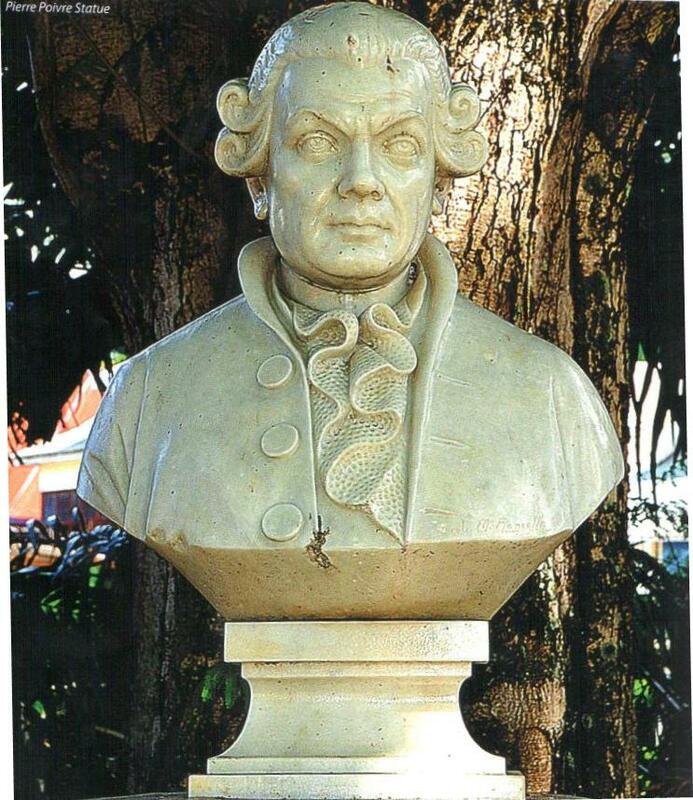 On the 2nd October 1972 the bust of Pierre Poivre was presented in the grounds of the Supreme Courthouse to commemorate the 200th anniversary of the introduction of Cinnamon to Seychelles – ironically by a man who had never set foot on the islands. Ernest Bickham Sweet-Escott and the Queen Victoria Memorial Committee, the official chairmanship Herchenroder had a plan. This great plan was resoluted in June of 1902, and it stated that a clock and dock tower would be erected in Victoria in loving memory of her late majesty Queen Victoria. All in agreement of such a project, the clock tower was made from cast iron and was purchased in London. It was shipped from London and arrived in Seychelles dismantled in nine cases, seven arriving on the 11th February 1903, and the other two mysteriously Disembarked in Mauritius. Thankfully enough, the two misplaced cases arrived one month later and the clock tower project began to materialize. After nine days, the Clock tower was officially erected and was inaugurated on the 1st April 1903. It was originally black but was painted silver in 1935 to commemorate and celebrate King George V’s Jubilee. It still stands today as a symbolic monument to the appreciation of Queen Victoria and the majestic link Seychelles has with the United Kingdom. 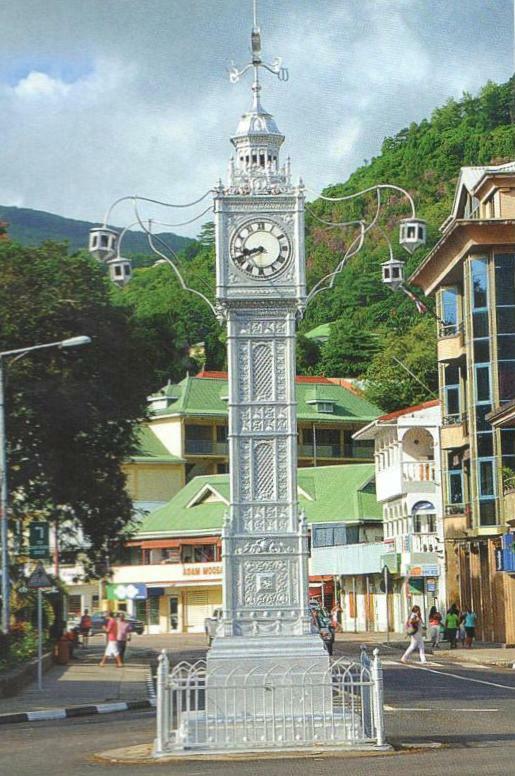 The Seychelles’ very own Little Big Ben! It was constructed in the 1850’5 and was the home of Dr. Henry Brooks of whom was the Chief Medical Officer of the colony. Later on around 1880 The Eastern Telegraphic Company bought the house from Dr. Brooks and the engineers lived there whilst they worked hard laying the cable link between Seychelles & Zanzibar. The house was then later named Kenwyn, after a village in Corn wall of which it is thought is where the underwater telegraph cables came from. As the years passed, from the 1900’s onwards Cable Wireless was established and Kenwyn house became the official residence for the company’s many general managers. In 2004, a South African company undertook the task of restoring the house that had fallen in decrepitude from years of Climate damage to its infrastructure and it regained its traditional beauty. 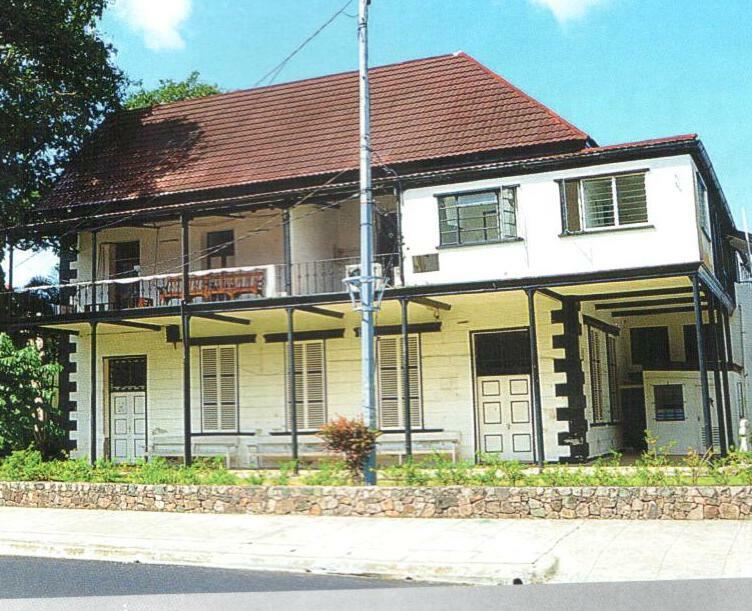 Kenwyn House is now a national Monument and holds all the trapping of a colonial creole dwelling and is a bewildering beauty in itself. Today anyone can visit the house of which now dwell dazzling selections of diamonds and tanzanite jewellery by Jouel and duty free items, as well as books, local paintings and sculptures. The Building itself dates back to the turn of the 19th Century when it housed the New Oriental Bank, of which after 5 years closed its doors. The building soon became the dwelling of the Legislative Offices of the administrator, Ernest Bickham Sweet-Escott. It is also said that on the 9th November 1903 that Mr Sweet-Escott took his oath as the first Governor of the colony of Seychelles in these very offices. However, there were others who also took office there. At some point the Eastern Telegram Company of whom layed the cables connecting Seychelles and Zanzibar were positioned there. In early 1976 as the Seychelles prepared for its independence, the building went under a lot of renovations; it became the new honourable house for the Constitution. 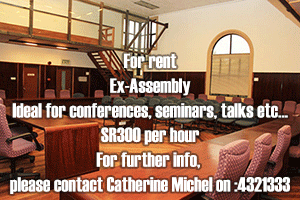 A magistrate’s court was officially established on the ground floor and a supreme court on the first floor. A beautiful building that has the creole touch and the timeless quality and historical significance still stands. The Seychelles has many sacred burial sites on the main island and also on other islands such as Alphonse, Cousin and Cerf Island to name a few. These burial sites are gardens of history because historical figures, liberated slaves and families are buried there and each one has interesting stories of why they came to Seychelles, who they were and what they did to contribute to the nation that Seychelles has become today. Under a backdrop of rainforest and a tapestry of majestic trees, the Bel Au cemetery evokes mysteriousness and an ancient disposition. The majority of people find cemeteries to be eerie and sorrowful, but the one at Bel Air is a different kind of cemetery. Bel Air cemetery was the first official burial to be opened on Mahe after the establishment of the French settlement in the 18th Century. 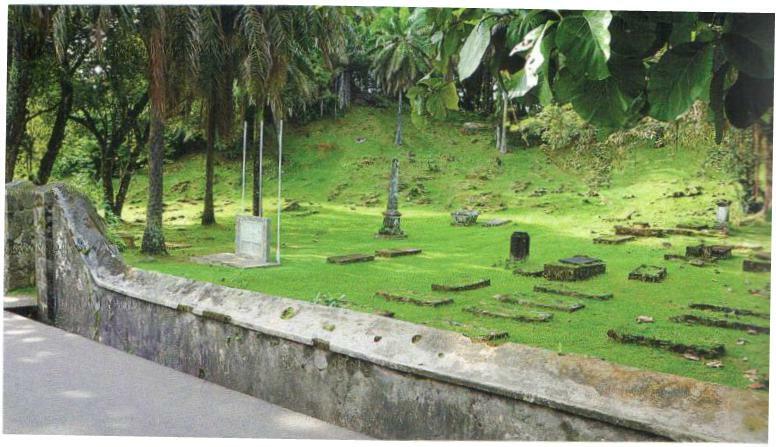 As the oldest burial ground in Seychelles, the cemetery holds many secrets and many mysteries. The cemetery was declared a historical site by the Victoria City Council in 1965 after it was neglected when it was dosed in 1904. And so, because of its historical significance it became a national monument in 1985. The visitor has the instinctive feeling that fragments of history still exist amidst the rubble, the graves and the family vaults. Prominent figures and the founding families of today’s generation are buried there, and interestingly enough the family vaults of the very first French settlers can be found at the cemetery. Etienne Dupuy who was a district magistrate and acting civil commissioner in 1862, lies in the Dupuy family vault along with his five other relatives. Jean-Baptiste Remy D’argent after whom one of the most beautiful beaches in the world – Anse Source D’argent on La-Digue is named after lies there. The buccaneer college of jean-Baptiste Quéau de Quincy, the corsair Jean-Francois Hodoul who died in 1835 is also buried there, along with many other family names of which many people are descendants of on the island. A lot of settlers who died in Seychelles that are buried there were born in Mauritius and migrated to Seychelles. In October 1862 many older graves were buried under the debris and mud of the Lavalasse (Avalanche) many were dislodged and washed away by raging floods. But the cemetery still braved the natural disaster and some older graves still remain, The oldest one found in the cemetery so far, is to a child. A young girl named Catherine Heloïse Larcher of whom died at the age of 16. After seeking her records it revealed that she married young, at the age of 13 and had had 2 children prior her death. Legend and creole folklore also has given the cemetery an immortalized reputation; that indeed the ‘Giant Boy’ is buried there. Giant? At the time of his death in 1870, at the age of 14 years old he measured a grand nine feet six inches tall! It is said that he could lift a sack of rice with only three fingers and that he was capable of dragging a pirogue out of the sea onto the shore. He was apparently named Charles Dorothée Savy and is believed to have been poisoned by neighbours who were frightened of his extraordinary height. His grave is out there in the cemetery and it should be quite a venture to find it. An interesting character lies at rest in the cemetery as well; Pierre-Louis Poiret who has been claimed to be the son of King Louis XVI who fled the French revolution and took refuge in Seychelles! No Wonder the cemetery is a National Monument and workers are employed to maintain it in good condition. So much of the Seychelles’ history and founding families lie there. Not to mention the Seychelles’ very own Giant!